What is a Natural Colored Diamond? When it comes to buying jewelry, it is important to know the real gemstones from the synthetic gemstones that have often been made in a controlled setting, such as a laboratory, rather than by time and nature. While the opportunity to own a diamond is one that many people desire, for those true connoisseurs of quality gemstones, nothing beats a natural diamond. A natural diamond is one that has been formed over countless years within the earth’s mantle at depths of around 18 to 118 miles beneath the earth’s surface and have been formed due to tremendous pressure and heat over time. Data on natural diamond growth from carbon-containing minerals estimates a growing period of 1 billion to 3.3 billion years for a diamond to form. By comparison, a high temperature and pressure are used in a laboratory setting to mimic the natural conditions present during the formation of natural diamonds. Other names for synthetic diamonds include lab-grown, man-made, cultivated, created, and cultured diamonds. What Are Common Colors of Natural Diamonds? There are many factors that come into play when choosing the right diamond for a particular application. Not only do diamonds form in different degrees of clarity, they also form in a wide variety of colors, some of which just may surprise you. Natural diamonds from within the earth have been found in a plethora of colors, such as steel gray, white, blue, yellow, orange, red, green, pink, purple, brown, and black. These varieties of diamonds achieve these colors due to impurities or defects during the formation of the diamond. The pure white versions of diamonds that we are all used to seem to be perfectly transparent and colorless but may contain microscopic irregularities or degrees of cloudiness. Regardless of the color, all diamonds are graded by four different areas, or the 4Cs, which are color, clarity, cut, and carat. Synthetic diamonds are also available in a wide variety of colors that can be created with the use of high pressure/high temp processes as well as irradiation after the formation of the synthetic diamond. Argyle diamonds are mined in the East Kimberley region in North Western Australia. What makes the this mine so unique is that it is the only known significant source of pink and red diamonds in the entirety of the world. Thus, it produces more than 90% of the world’s supply of these colors of diamonds. The mine has also been known to produce diamonds in champagne, cognac, and blue colors. For those individuals looking for pink and red natural stones, each year, a small collection of the best pink diamonds are offered in an exclusive sale known as the Argyle Pink Diamond Tender. These stones are so rare that the mine itself has developed its own way of grading the stones that it produces in these rare colors. The pink diamonds from the Argyle Mine are divided into four categories: PP (Purplish Pink), P (Pink), PR (Pink Rosé) and PC (Pink Champagne). After the initial color-based grading, the diamonds are graded based on their individual color intensity. This ranges from 1 (the highest) to 9 (the lowest). The rarity of the color of diamonds found in the Argyle mine, as well as the projection of the mine to close in 2020, makes these diamonds more in demand now than ever. While there are many places in the world that diamonds can be found, nowhere else is this density of pink and red gemstones found than here. When you are talking about pink diamonds, as opposed to the much more recognizable clear diamonds, the difference lies within the formation of the diamond itself. Considerable amounts of heat and pressure within the earth’s mantle cause the crystal lattice of the forming diamond to distort. The result of these distortions causes the stone to absorb green light and and result in an overall pink color. A closer look within the diamond reveals parallel bands within the pink diamond. For pink Argyle diamonds, a variety of settings for jewelry have been made available. From halo, pave’, and tension settings, stones in these settings can be cut in all of the popular styles and fit into jewelry pieces from rings, necklaces, earrings and just about anything that you could dream of. When it comes to finding the right pink diamond to add that perfect touch to your jewelry collection, the sky’s the limit. Violet diamonds are something truly special. This color is very rare in naturally occurring diamonds found within the earth. Commercially, the considerable majority of marketable violet diamonds are found to come from the Argyle mine in North Western Australia. The resulting violet color in this diamond has been found to be related to hydrogen being present at a certain point in the formation of the gemstone. Naturally occurring violet diamonds are often very small when compared to other colors of diamonds, and thus stones greater than 1 carat are extremely rare. A closer look at a violet diamond reveals a gray component in the majority of stones. To find a pure violet colored diamond, you are looking at a demographic of less than 10% of all violet colored diamonds being found. Just like pink diamonds, a violet diamond can add that perfect touch of something special to your jewelry collection and is something truly special indeed. Whether you are looking for a princess cut violet diamond in an engagement band, or a heart shaped diamond in a necklace, a violet diamond in any cut, clarity, or setting is something truly special to behold. Just like pink and violet diamonds, red is a very rare color in naturally occurring diamonds. For all intents and grading purposes, a red diamond is a very strongly and deeply colored pink diamond. A close examination of a red diamond has revealed the same cause of color as a pink diamond, which is crystal distortion within the gemstone itself. The combination of strong pink coloring and crystal distortion occurs so rarely in naturally occurring diamonds that the large majority of jewelers and diamond dealers have never even had the opportunity to see an actual natural red diamond. 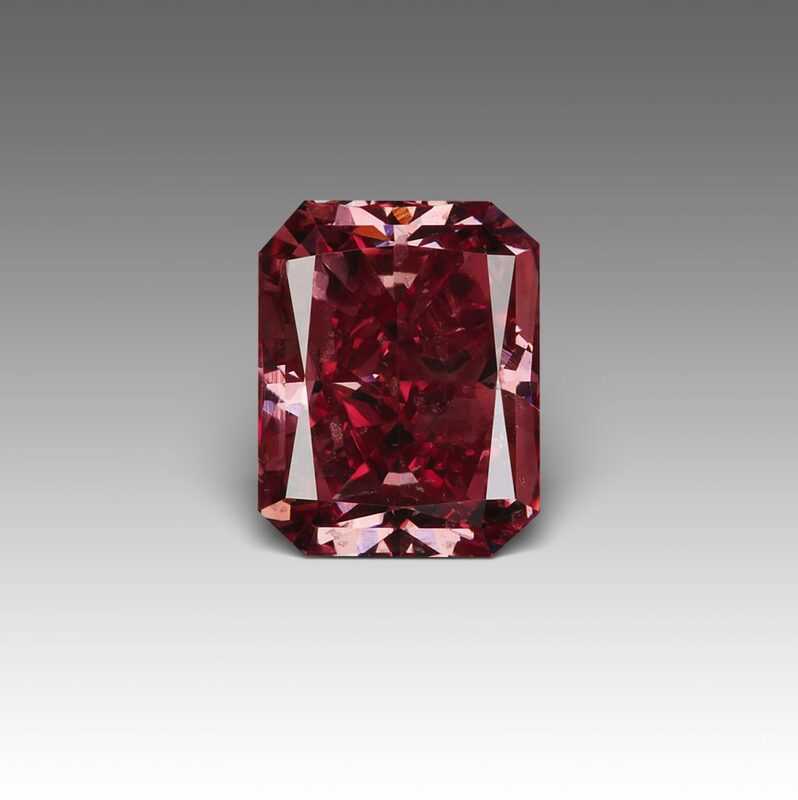 While easy to mistake for a ruby from afar, a red diamond is richer in color and considerably more unique than the more easily acquired ruby. A red diamond is a truly special and unique gift to give anyone in the form of jewelry. From rings to necklaces and from broaches to earrings, a red diamond is sure to catch the eyes of many when the light catches its facets just right. Whether it is an anniversary or Valentine’s Day, any time is a great time to bring home a red diamond. While not as rare as red, violet, and pink diamonds, yellow diamonds offer a more readily available way to own a colored diamond that is sure to make people stand up and take notice. Naturally occuring yellow diamonds are created in the earth’s mantle by the presence of nitrogen atoms that have grouped themselves in specific ways within the stone itself. This color transmutation happens both during and subsequently after the diamond itself is formed. The arrangement of nitrogen atoms cause the diamond to absorb light in the blue region of the light spectrum that results in a visible yellow color. These diamonds have been known to contain an orange, green, or brown modifying color in addition to the yellow color itself. Yellow diamonds of gem grade quality and clarity are most commonly discovered in South Africa. Not to be confused for sapphires, blue diamonds are rare, unique, and unforgettably beautiful. The resulting blue color comes from the bonding of boron to carbon that then causes the absorption in the red, yellow, and green parts of the light spectrum that then produces a blue color. The resulting blue color of the diamonds may contain touches of gray, violet, or a greenish modifying color. In terms of production, this occurs in the village of Cullinan and the Premier Mine located in the Golconda region of South Africa. This color of diamond is most well known for the Hope Diamond and its brilliant blue color and immense 45.52 carat size. While not all of us could afford a blue diamond of that size, there are many more reasonably priced and widely available blue diamonds out there on the market in many sizes, color variations, settings, and prices. When it comes to choosing the right piece of jewelry with a blue diamond, the sky’s the limit.